Fire Guts Two Capreol Buildings. 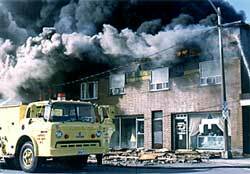 On Thursday May 1,1986, the Capreol Fire Department responded to a fire at 7:15 a.m. Arriving at the scene on Young Street, they immediately called in for back up and were soon joined by the Nickel Centre and Valley East Fire Departments. Twenty seven firefighters along with seven trucks from Capreol and the Region battled the blaze with onlookers eyeing the scene in awe. Four firefighters were injured as a brick wall from the Capreol Pro Hardware came down. All were treated by the ambulance attendants with only one sent home due to his injury. The stores damaged by the fire were Lalonde's Pharmacy, Mazzuca's Building which included Capreol Jewellers, Suzanne's Coiffure, Lynn's Place, Art's Barber Shop, five apartments and the vacant Audion Theatre. The damage was estimated by Mayor Frank Mazzuca to be one million dollars. Capreol Fire Chief Jack Desrochers said the fire probably started at the rear of the Pro Hardware building and was spotted by a garbage collector shortly after 7:00 a.m.